TALMAR serves people of all ages and abilities with a focus on those with special needs and disabilities. Our goal is to contribute to the mind, body, and spirit of the individual. TALMAR is a leading provider of horticultural therapy programming throughout Maryland. 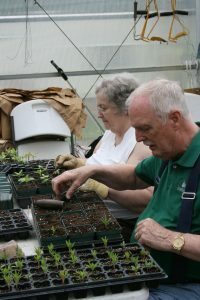 Our horticultural programming is beneficial to everyone from seniors to veterans and special needs organizations. 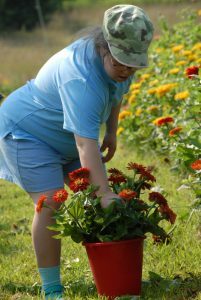 The goal of our organization is to assist participants in learning new skills, provide education and contribute to general mental and physical wellness through horticultural activities. TALMAR accommodates individuals and groups for one hour sessions with up to 6 participants. To schedule our services for either individual or group sessions, please email Tanya Ray or contact us at 410-825-2020. TALMAR is pleased to be working in partnership with the Veterans Administration in a pilot program that trains veterans who are also experiencing mental health challenges, in a beginning farmer program in Sustainable Agriculture. Both classroom and practical hands-on experience continues throughout the sessions. We are offering three sessions this year. The first two (a 14-week curriculum that is a prerequisite to the ten month course) is up and running (and quite successfully, we might add). Ten of the veterans from sessions one and two will be selected to continue training through the duration of the session (generally in November, dependent of the weather). Our third session is less focused on sustainable agriculture. It offers an introduction to several career opportunities in the field of agriculture including landscape maintenance, floriculture and greenhouse production. We are excited for this new program and look forward to growing with our veterans. For more information regarding this program, please contact the VA or to our Veteran Instructor and coordinator, Kate Long by email (katelong@talmar.org)or call 410-825-2020.